This spring, Elon launched Elon LEADS, a comprehensive campaign that allows Elon alumni to come together to strengthen our university. By investing in the transformative experiences and relationships that Elon inspires, we will empower students to reach their full potential and become leaders in their communities and in the world. Through Elon LEADS, donors will build on Elon’s position as a leader in higher education by investing in graduates the world needs, engaged learning, mentors who matter and the university’s iconic learning environment. Some alumni give to Elon to honor a faculty member or a lifelong Elon friendship. Others donate to show gratitude for a scholarship that made their education possible. Still others give so that current students have access to the programs and academic experiences that shaped their own time on campus. Whatever the reason, alumni who support Elon help strengthen its future by bringing talented students and faculty to campus and providing the resources they need for success. Alumni donors provide key financial resources for the programs and people that make Elon an exceptional place to learn. In addition, national rankings of colleges and universities measure annual alumni support as a key indicator of an institution’s quality. In other words, your annual gift of any size plays a direct role in maintaining the university’s national reputation and the value of your degree. Alumni can choose from a range of giving options to make sure that their contributions to Elon best fit their priorities. Ways to give: Give an annual gift in the way that works best for you—online, by phone or by mail—or consider additional giving options such as matching gifts and estate gifts. Designated giving: Make an impact on what matters most to you at Elon by designating your gift directly to scholarships, engaged learning experiences, academic schools, student organizations, the Phoenix Club, a specific athletic program, or other areas of campus. Frequency: Decide the timing of your gift with Elon’s one-time, monthly and annual gift options. See the impact of giving at Elon. 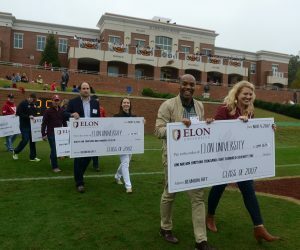 The 1889 Society recognizes loyal Elon donors who support the university for two or more consecutive years, as well as donors with recurring gifts and Elon students who make gifts during their senior year. Learn more at www.elon.edu/1889society.